Nelson Mandela spent 27 years in a prison in South Africa. His crime? To serve as president of the illegal African National Congress (ANC), which sought to end the harsh repression of the black majority in the country. Increasingly during the 1970s and 1980s, the rest of the free world came to denounce, through boycotts and demonstrations, both the segregation policies and Mandela’s continued exile. Mandela’s wife, Winnie, led the worldwide effort for decades to demand his release. Following this walk to freedom, Mandela became the first black president of South Africa in 1994, in the first election in which all South Africans were allowed to vote. 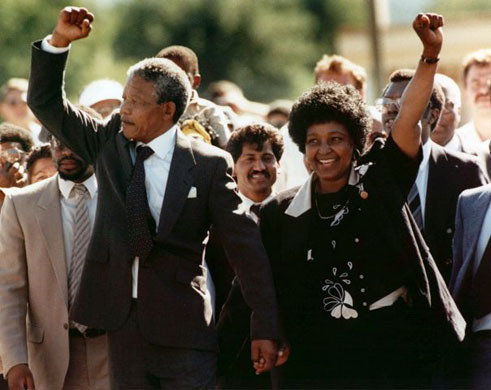 On This Day: Nelson Mandela Released From Prison. FindingDulcinea. 11 Feb. 2010. Accessed On 19 Nov. 2010.